Carat size is a priority for most people. After all, it's the first question admirers often ask and one of the easiest things to spot. Most people have a goal for the size of diamond they'd like to get, such as the coveted 1-carat mark. And because most people have at least some kind of budget, they often sacrifice other qualities in the diamond to get the size they want. While we don't necessarily agree that carat should be your top priority, we do understand it's likely to be an important factor in your decision. 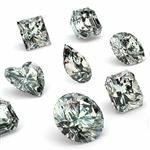 This article will give you a better sense of diamond sizes and tips for shopping on a budget, but you'll also learn why your biggest emphasis shouldn't be carat. 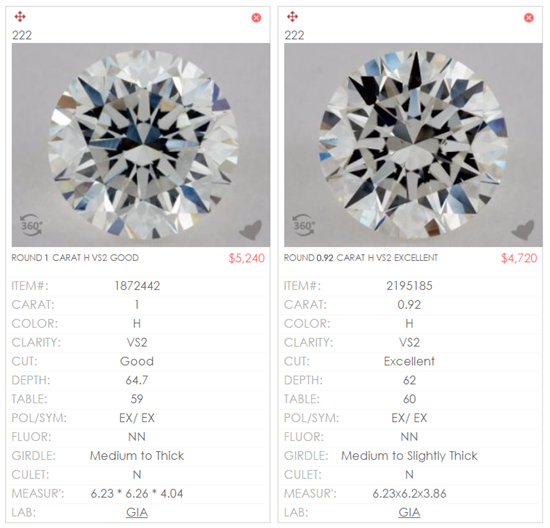 Use the diamond size charts below to compare for yourself and see how carat affects pricing. That way, you can get the biggest diamond for your budget. Carat actually refers to the weight of the diamond, not the size. One carat is equal to about 0.2 grams, which is roughly the weight of a paperclip. The heavier the carat weight, the larger the diamond. The word "carat" actually comes from the Greek word for "carob," a type of tree with seeds that have a very uniform weight. In the ancient days in Europe and Middle East, the carob seeds were used as a reference for traders - especially for gemstones - to determine very slight differences in weight. A diamond carat is still the same weight as a carob seed today. It's hard for people to visualize how a certain carat size will look on their finger. To help you out, we put together this diamond size chart of popular carat sizes and shapes. Note that these charts only represent an approximate dimension. For example, some emerald-shaped diamonds are short and fat and some are long and skinny. Because diamonds are priced on a per-carat basis, carat has the biggest impact on price. The price increases exponentially as carat increases, so a 2-carat diamond is not just double the price of a 1-carat diamond. This is because it's getting harder to find the rough material good enough to be cut into a single, large-sized diamond. Let's look at how carat affects price. These diamonds all have a color of H, clarity of VS2, and an excellent cut for ease of comparison. The only difference is the carat size. In the diamond industry, these are the "magic numbers" for carat weight: 0.5, 0.75, 1.0, 1.5, 2.0 (and every half carat thereafter). These are the points at which there is a significant jump in the price. You can see that at each point, the price approximately doubles. 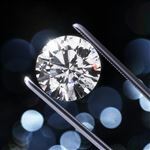 Of course, the other 3Cs (cut, color, and clarity) all play a role in determining the final diamond price. We have a whole beginner's guide you can check out to see how all of the 4Cs affect prices and how to get the best value. We know you're probably hoping to hit a certain carat number, but this shouldn't necessarily be your top priority. Instead, we think you should focus on getting the best cut possible. An excellent cut makes the diamond more brilliant and can hide flaws and mask color. Not only that, but it also makes a diamond larger (or rather, the size it should be). We have a detailed article explaining everything you need to know about diamond cut. We STRONGLY suggest you read it before making a diamond purchase. So even though the two diamonds have different carat sizes, they have the same surface area. Because of the poorer cut of the first one, about 10% of the carat weight is wasted. So the diamond on the left hits the coveted 1-carat mark but it's not going to sparkle as much as the one on the right. For about $500 less, the 0.92-carat diamond on the right is a much better buy. This is why you shouldn't place so much importance on carat weight. Weight doesn't do much when you can't even see it. And no one wants a lackluster diamond. This is just a quick warning to be careful, especially when you're buying a pre-set ring. A lot of first-time ring shoppers may not catch the distinction of this little sneaky term. Total Carat Weight (TW or CWT or CTW) refers to the weight of ALL diamonds on the ring. This includes the little melee diamonds used in a halo or pavé band and any side stones. Meanwhile, carat weight is the just weight of the main central diamond. This is just a trick that jewelers use to make their rings sound more impressive. Just be careful to make sure you know exactly what you're getting. Let's face it, few people are able to afford a 2-carat stone. Heck, most people struggle just to reach the 1-carat mark. Use settings to make the diamond appear larger. One of the most popular settings is the halo, which has a ring of small diamonds around the center diamond. This setting gives off serious bling and makes it look as if the diamond in the middle is huge (as seen on the left below). Another good setting to go with is a thin pavé band. Setting the main diamond within a band of small diamonds will make the center stone pop. Remember that the thinner the band, the larger the center diamond will appear (as seen on the right just below). If you're not sure what kind of setting style and shape to choose, check out Blue Nile or visit James Allen's Inspiration Gallery before you buy an engagement ring. 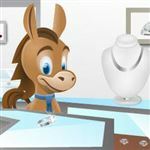 This feature allows you to see real images of rings people have purchased in the past and can help you figure out what style matches you best. Watch out: The worst settings for trying to make a diamond appear larger is the 3-stone or side stones. Thick heavy bands don't help smaller diamonds. Look for a diamond slightly under the magic numbers. The magic numbers are every 0.5 carats. At these weights, diamond sellers can fetch significantly more. If you go just below a magic number, you can pick up a diamond for as much as 25% less. For example, a VS2 H Excellent cut diamond that is 1 full carat will cost you around $5,800. But if you keep the other Cs the same and just drop the carat weight to 0.9, you'll also drop the price down to $4,800. And nobody will be able to see the difference. See other diamonds under the "magic number". Consider a fancy-shaped diamond. One of our favorite suggestions is to go for shape besides round. Not only do fancy-cut diamonds often appear larger than they are, they're cheaper than round too. And plus, they are more unique and will appeal to girls who like to stand out in a crowd. Go lower in color and clarity. We've already made it clear that cut should never be sacrificed. But you can go lower in color and clarity to lower the price tag. As long as the cut is excellent, the diamond will still appear brilliant, even if there are other slight flaws. We usually recommend a minimum color of H and clarity of VS2. But you can go down to a color of J if you don't mind a warmer look. 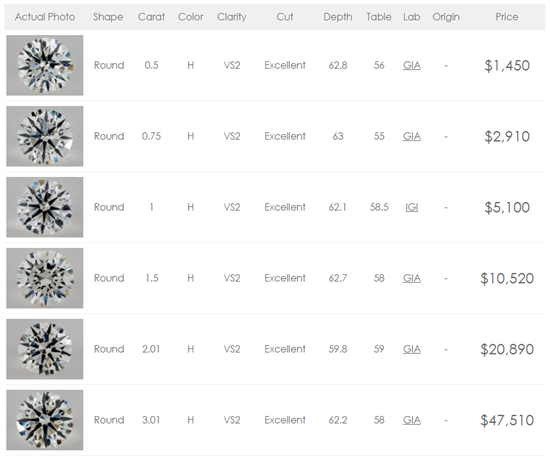 And there is some amazing value in SI2 diamonds if you find one that's eye-clean. Carat is the most difficult of the 4Cs to advise on because it's such a personal choice. And we totally understand if there's a goal you want to hit. All we can suggest is that you don't make it your absolute top priority at the expense of the overall beauty of the ring. Focus on getting the best cut you can on your budget instead. A well-cut diamond will sparkle beautifully, and after all, isn't it much better to have a beautiful diamond instead of just a big diamond? Share on Facebook "Diamond Size Chart: Everything You Need to Know"